SGI has introduced three Pentium-powered, graphics-optimized workstations that can run either Microsoft Windows NT or the Linux open-source operating system. The SGI 230 workstation is one of three new models running Linux or NT and replacing SGI's earliest NT models. The SGI 330 and 550 workstations replace the NT-only 320 and 540 models in the company's 32-bit product line, said Ujesh Desai, SGI's IA-32 product line manager. The new models drop SGI's proprietary architecture in favor of standard Intel architecture, Desai said, making them easier to use with third-party devices. Pentium III processors power all three workstations. The SGI 550 has one or two 733- or 800-MHz Pentium III Xeon processors; the 330, one or two 733- or 800-MHz Pentium IIIs; and the 230, a single 667- or 733-MHz Pentium III. The 230 and 330 models each can accommodate up to 1.5G of synchronous dynamic RAM. The 550 handles up to 2G of the more advanced Rambus Direct RAM from Rambus Inc. of Mountain View, Calif. The 550 and 330 come with SGI's new 64M VPro double data rate (DDR) graphics card, Desai said. Buyers of the 230 have a choice of a 32M VPro DDR card or a 64M VR3 graphics card. A 133-MHz system bus is standard on all three models. The IA-32 workstations are aimed at engineers and users who do computationally intensive graphics such as geospatial imaging, said Bob Pencek, systems engineering manager for Silicon Graphics Federal Inc. of Silver Spring, Md. There are three operating system choices: NT, Red Hat Linux 6.1 from Red Hat Inc. of Durham, N.C., or no OS, for buyers who already have an NT site license. SGI is working to certify the machines for other Linux distributions, Desai said. Starting prices for the SGI 550 are $4,995 with NT, $4,895 with Linux and $4,825 without a preinstalled OS. 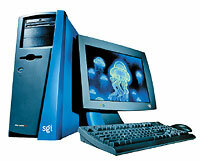 The SGI 330 lists for $3,995 with NT, $3,895 with Linux and $3,825 without an OS. The SGI 230 is $2,895 with NT, $2,795 with Linux and $2,725 with no OS. None of the above prices includes a monitor.